In 2007, Polish Parliament constituted the Polish Card, a document which doesn’t grant the Polish citizenship but confirms the identity of a card’s owner to the Polish nationality. A similar idea appeared in Lithuania. 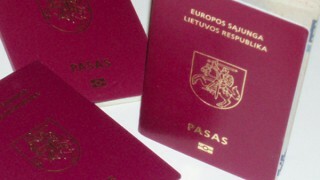 During the discussion considering the possibility of granting double citizenship to Lithuanian immigrants, the issue of Lithuanian card emerged. For some time, in Lithuania the discussion regarding the legalization of double citizenship is ongoing. As for now, the right belongs to the persons who left Lithuania before 1990 and their offspring. The ones who left the country after regaining the independence don’t own the right. Double citizenship is granted to the persons who gained the citizenship automatically, i.e. by marrying a person with a citizen of another state and by giving birth, when at least one of the parents is a Lithuanian. The liberalization of the right can be done only by means of referendum: most of Lithuanians would have to agree for a change in the appropriate entry in the Polish Constitution. Lithuanian emigrants lobby for double citizenship. The issue is discussed each time during the meetings of Lithuanian authorities with the representatives of emigration. In the meantime, the idea of constituting the Lithuanian Card – the document which would help the Lithuanians living abroad in maintaining their relations with a homeland appeared. The sole document would have only emotional meaning, it would confirm the relations with a homeland but it would not solve any problems. Therefore, legislative amendments granting proper rights would have to be accepted. In some states, the card owners are entitled to free visa for a long-term staying because not all emigrants live in the countries in the Shengen area.’ –said Juozas Bernatonis, the Minister of Justice at the meeting with the representatives of Lithuanian emigration. The minister believes that similarly to Poland or Hungary, the card owner would have the right to education and free medical care. Bernatonis assumes that those who had the Lithuanian citizenship but left the country and lost it should be privileged to acquire the Lithuanian Card. The representatives of Lithuanian emigration do not oppose the idea of constituting the Lithuanian Card; however, they stress that it wouldn’t substitute the passport of a Lithuanian citizen. Thus, they opt for the possibility of having double citizenship. Dalia Henke, the chairperson of the World Lithuanian Community minds that when emigration doesn’t decrease and the number of Lithuanians living abroad is on the increase, everything should be done to maintain close bonds with their homeland. ‘Granting certain allowances to emigrants may contribute to preserve those bonds. Nevertheless, double citizenship is the main goal’ said a Lithuanian activist. Juozas Bernatonis, the Minister of Justice announced that more precise offers considering the Lithuanian Card will be prepared till the fall. The MP Linas Balsys, who is a member of the Committee of migration, reckons that the idea with the Card is ineffective: ‘It is either populism or a wish to find something that would replace double citizenship. It’s simply insulting to those who left Lithuania’. The MP reminded the dissatisfaction resulting from the constitution of the Polish Card by Poland. To recall, the Lithuanian citizens who owned the Polish Card were deprived of the law to participate in parliamentary elections and occupying the vacancies that require taking the vow. The legality of the Polish Card was questioned in the Constitutional Court.